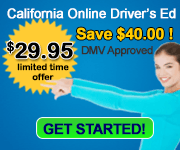 We offer an online driver's education course. The course may be completed in the comfort of you're own home, with out any classroom attendance. The curriculum is recognized by the Department of Motor Vehicles.